It’s nearly impossible to win a basketball game where a team turns the ball over 20 times. 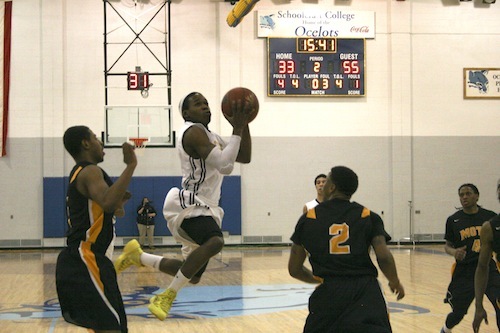 Schoolcraft committed 28 turnovers in the Jan. 22 84-62 loss to Mott Community College. “We knew we couldn’t be double digits [in turnovers]. If we are going to win, we have to be under ten,” Schoolcraft head coach Randy Henry said. With 38 and 31 turnovers in each of the previous two games, both resulting in Schoolcraft losses, the Ocelots improved that number against Mott, but the 28 turnovers led to 33 points in fast break for the Bears. “Nobody’s going to be perfect, but they [Mott] had six turnovers at half and ended up with eleven,” Henry said. Unlike the previous two losses, Henry saw some bright spots in the defeat that showed him that his team would be able to persevere. “The losses against St. Clair and Macomb I didn’t see anything to feel good about. But this game, you had [Anthony] Douglas and Daehan [Dye] played well,” Henry said. Anthony Douglas (two points) and Daehan Dye (six) played valuable minutes off of the bench. Douglas played more minutes than one of the starters and Dye contributed 13. The ‘D Duo’ only scored eight points, but they were able to balance the Ocelots out when starters Drew Mapley (seven points) and Terrell Sewell went out with two fouls apiece in the first eight minutes of the game. Mapley and Sewell were held out of action until the opening of the second half. Schoolcraft jumped out to an early 4-0 lead in the first three minutes of the game before Mott scored eight consecutive points in less than a minute on four layups and dunks with four different players. That was the story all night as the Bears scored on 58 of their 84 points in the paint on high percentage, easy shots. The Bears took over the rest of the first half shooting 46% from the field leading to 42 points. Schoolcraft’s struggles on defense transitioned to the second half as the Bears’ hot shooting continued. Mott raced out to the tune of a 15-6 run primarily of layups and free throws. Bench play was key in the Mott victory. Jamal Reynolds (eleven points), Chester McFadden (eight points), and Chase Krager (two points) chipped in with steady play from the Bears Bench. “You can’t do it with just five. Look at Mott, they had 10 guys that could play,” Henry said. Despite the loss, the Ocelots are looking into the future to ease their pain. With games against Kirtland, Wayne County, and Delta all in a seven-day span starting on Jan. 25, Schoolcraft has to be able to put the defeats of the past behind them. Constant improvement has to continue in the next three games that have been visible all season. 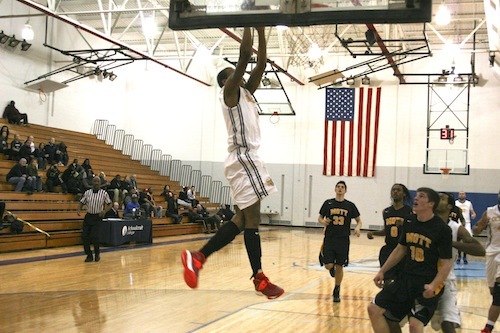 Devanta Riley led Schoolcraft with 12 points. Terrence Coles and Basel Ibriahim followed Riley with 11 and 10 points respectively. The Ocelots are currently in fifth place in the MCCAA Eastern Conference with a record of 3-5, 10-8 overall as of Jan. 22.